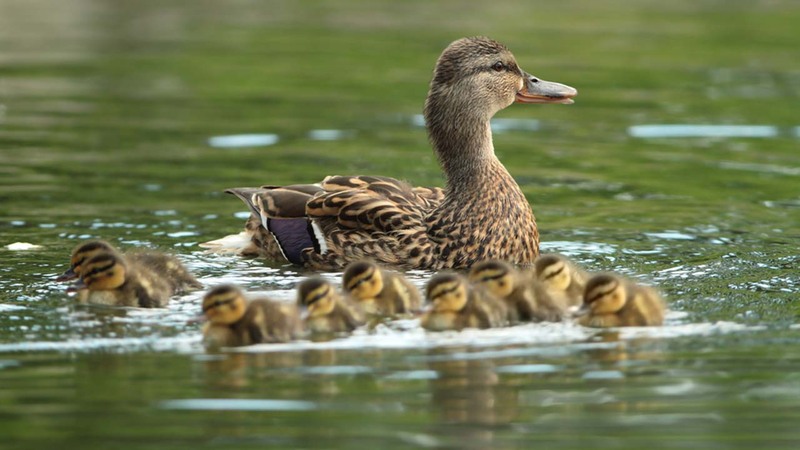 HARTLAND, MI -- A mother duck has grown attached to a Michigan elementary school's courtyard, returning each year to lay her eggs and then walk the hallways with her ducklings - with the help of students and staff - to safely get to a nearby pond. The duck named Vanessa has appeared at Village Elementary School in Hartland for the past 13 years, and her latest waddle through the school took place last week, the Livingston Daily Press & Argus of Howell reports. The duck flies into the closed-off courtyard, where children in the surrounding classrooms can take a peek out the window to watch, and she crawls under a specific shrub, digs out her nest and lays her eggs. It's there that she waits for them to hatch. After the ducklings appear, now-retired teacher Ruth Darrah and others tape black construction paper along the walls, creating a clear path for the ducks to get to a nearby pond outside the school. Teachers and staff make sure students are out of Vanessa's path so they don't frighten her. "It's so unusual, but everyone gets so invested in this duck because how cool is it that she comes back each and every year," said Elizabeth Krause, a mother who has witnessed the duck's appearance almost every year. This year's hallway waddle took place on Thursday. The duck waited by the courtyard door for it to be unlocked and waddled with her eight ducklings through the school within minutes. "She has it down by now, after 13 years," Darrah said.